...a selection of photo's from our customers. A great tool to visualize our products in your own back yard! Walkway to the Pool over gravel. Keeps grass & mud out of the pool & the house. 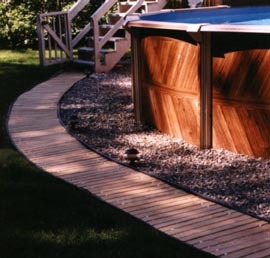 Narrow Spacing between the Walkway Slats is best for bare feet around the pool. 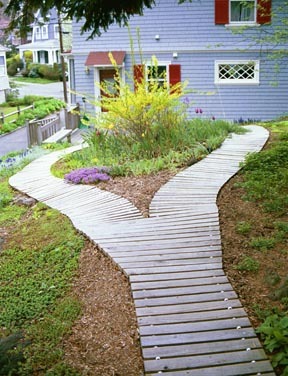 Walkway around the Yard & Garden. 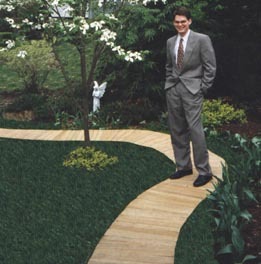 No Spacing between the Walkway Slats was used so the grass would not grow between the slats. Roll Out Beach Walkway over the dunes. 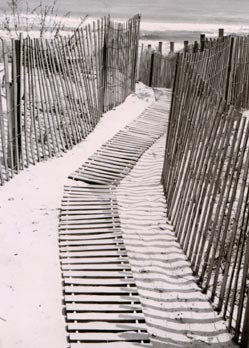 Protects the dunes from pedestrian erosion. Helps keep sand out of the house. Makes the walk to & from the beach a snap instead of an ordeal. Wide Spacing between the Walkway Slats lowered the weight for easy off season storage. Garden Walkway to the Garage over mulch. Wonderful Winter Features allow shoveling (sideways) or snow blowing the walk. Treated Southern Pine (and TREX®) stand up to salt just fine so the walk is never icy. Narrow Spacing between the Walkway Slats. 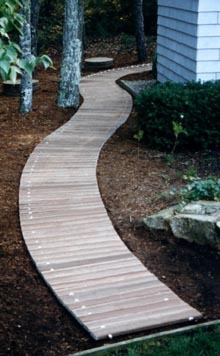 Walkway to the Outside Shower over mulch. Made with TREX®, wood polymer lumber. Narrow Spacing between the Walkway Slats was used to make the walkway more comfortable for bare feet.